Susan Spaulding, kitten expert and star of the Loudon SPCA's film, Feline Neonatal Care, stopped by with tips and free DVDs for New Jersey Kitten Palooza! workshop participants. The NYCFCI's Valerie Sicignano instructed this workshop, which included a screening of the Loudon SPCA film, Feline Neonatal Care, (available from Alley Cat Allies) and written instructional information. 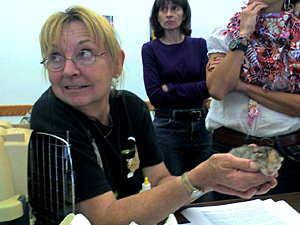 The highlight of the workshop came when Susan Spaulding, neonatal kitten expert and the star of the featured film, surprised everyone with an unannounced visit. Susan shared her invaluable wisdom and experience with the workshop participants, and then supplied each one with a free DVD of the film, before taking home a litter of newborn kittens from the Liberty Humane Society! Urban Cat League President Mike Phillips instructed the "Socializing Feral Kittens" portion of the May 15 Kitten Palooza! workshop in New Jersey. Immediately following the workshop, attendee Patty Drumgoole stopped in at the Liberty Humane Society's nearby shelter and picked up her first litter of young kittens to foster. Nearly all of the New York and New Jersey attendees have taken in litters of kittens to foster. 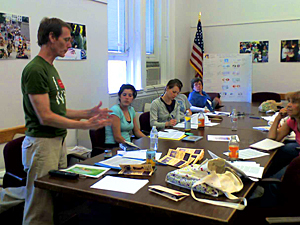 Mike Phillips, President of Urban Cat League, instructed this workshop, which included film clips from Urban Cat League's film, Tough Love: Socializing Feral Kittens, and written instructions for all attendees. A New Jersey animal control officer and Molly Griffin from Alley Cat Allies were among the workshop participants. New Jersey resident Pat Taylor, who attended the same workshop the previous week in New York City, came back to share her experience with applying what she had learned at the previous week's workshop to the older kittens she has been trying to tame. Pat reported that she had made more progress in one week than she had in the previous months! The NYCFCI is grateful to Carol McNichol of the Neighborhood Feral Cat Initiative and Companion Animal Trust for organizing the workshops. Valerie Sicignano is Director of Special Events & Training for the New York City Feral Cat Initiative and has been working with feral cats in New York City since 1990. She holds a Certificate in Humane Education from the ASPCA, and her work with animals has been recognized by the Manhattan Pet Gazette's "Animal Guardian Award" and In Defense of Animals' "Companion Animal Guardian Award."